The name of Scylla is a famous one in Greek mythology, although it is a name primarily connected with the monster who operated opposite Charybdis. There was a second famous Scylla in Greek mythology; this Scylla being a princess of Megara. Scylla was a daughter of Nisus, King of Megara, and his wife Habrote, making Scylla sister to Eurynome and Iphinoe. Scylla would come to prominence during the war that was being fought between Athens and Crete. Androgeus, the son of King Minos of Crete, had died whilst in Athens, and so Minos sent his army against Athens. Megara was a region of Attica, and an ally of Athens, for King Nisus was brother to King Aegeas of Athens, both being sons of King Pandion II. Thus, during the war Megara was attacked by the forces of King Minos. Nisus though was invulnerable for on his forehead was a magical lock of purple hair, and so the king rallied his defenders, and Megara held out against the Cretan army. King Minos would arrive on the battlefield, and from affair Scylla observed the king of Crete, and fell in love with him, possibly after the manipulations of Eros. Scylla decided to show her love for Minos by removing the purple lock from the head of her father, causing him to die, and the city of Megara to fall to King Minos. 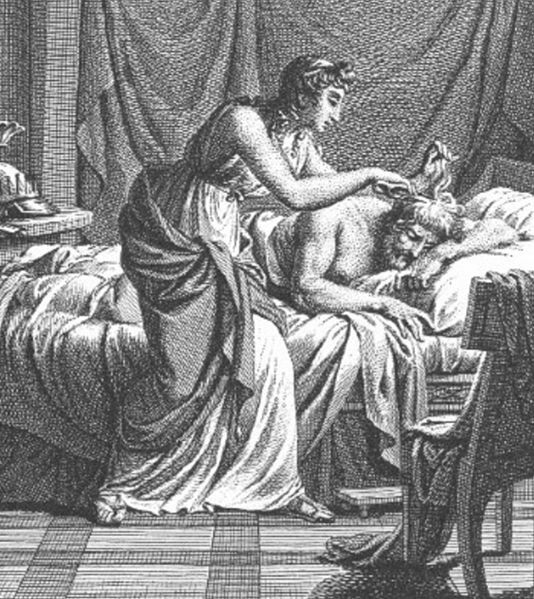 Some tell that it was not an affair of love that caused the downfall of Nisus, but simply bribery, with Minos offering Scylla a golden necklace. Having acted, Scylla went to King Minos, but the king of Crete did not love Scylla, and rejected the daughter of Nisus, for he had no wish to be near someone so treacherous. Thus, Minos sailed away from Megara. Scylla though, was still in love with Minos, and so she attempted to swim after the Cretan fleet, and drowned in her fruitless pursuit. Some tell it was Minos who bound her and drowned her, because of the lack of loyalty shown to her father. As she died, it was said that Scylla was transformed into a small sea bird, or a fish; but at the same time Nisus had been transformed into an osprey, or a sea-eagle, and the father flew after his treacherous daughter, a pursuit that continues even today. The story of a daughter turning against father is not an uncommon one in Greek mythology, and indeed, later King Minos’ daughter, Ariadne, would aide Theseus in the killing of the Minotaur. Pisidice and Leicophrye also betrayed their fathers for the presumed love of attackers.